Astronomers have proposed a truly enormous telescope consisting of 200,000 radio receivers around the world, which added together would cover an area the size of Nebraska. They hope to spot incredibly energetic but difficult to detect neutrinos coming from distant astrophysical sources. 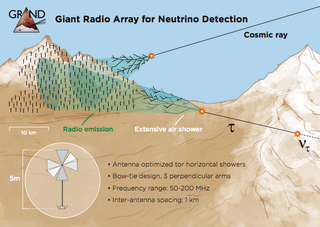 The Giant Radio Array for Neutrino Detection, or GRAND, would hunt for these elusive particles with a greater level of sensitivity than any telescope before it. The proposed project could potentially explain those “fast radio bursts” we often cover, and map the sky with extreme precision. The proposal, posted to the arXiv server last week by the experiment’s collaborating scientists, suggests that GRAND as the next step in the new era of “multi-messenger astronomy,” in which scientists are able to observe the cosmos through things other than light, like neutrinos or gravitational waves. GRAND is incredibly ambitious, to say the least. GRAND’s core reason for hunting neutrinos is rather roundabout. There are particles called Ultra High Energy Cosmic Rays that occasionally blast the Earth with inconceivable energies, a billion times higher than those created in the Larger Hadron Collider. But the origins of these particles are unclear. The various magnetic fields permeating the universe change the directions of these particles, so you can’t just trace them back to the direction they came from; their trajectories don’t point back to their sources. Instead, scientists think these particles interact with photons along their journey and produce a kind of particle that doesn’t bend in these magnetic fields: the difficult-to-detect neutrino particle. This should sound familiar – the IceCube collaboration recently spotted a high-energy neutrino that came from the same spot in the sky as a blazar, a galaxy spewing a jet of other high-energy particles pointed directly at the Earth. The GRAND folks hope their experiment will eventually hunt for yet-to-be-detected neutrinos that are ten thousand times more energetic than those detected by IceCube, which would correspond with even higher-energy cosmic rays occasionally found by scientists. The initial proposal calls for 10,000 radio antennae deployed over 10,000 square kilometers in some radio-quiet location, probably in China, by 2025, then 20 times that number by the 2030s. These antennae would sit on one side of mountain valleys and measure neutrinos skimming and then hitting the Earth from the valley’s other side, passing through and creating a shower of secondary particles. That particle shower then creates a characteristic radio signal as it passes through the air. GRAND could also detect cosmic rays (high-energy particles) or gamma rays (high-energy light) that interact directly with the Earth’s atmosphere, as per the below diagram. The collaborators are already deploying 35 antennae in western China’s Tian Shan mountains. An upgrade to 300 would cost around £1.175 million, and a 10,000 antennae sub-array would cost some £13.3 million. The full experiment, with 200,000 antennae around the world, would run to £177 million.